Once upon a time, there was a little girl whose father had passed away just a few weeks before Songkran. Not the type that sobbed and bawled, she just went about her business quietly with her senses somewhat deadened and dazed, all the while carrying in her heart a void that felt bigger than the heart itself. A lengthy and elaborate funeral had just come to an end. The people in her little world had just stopped wearing black. And though life would never again be the same, at least, for the time being, there would be no more well-meaning strangers who whispered into her ears words that neither soothed nor healed or fools who tried to console her by saying Daddy was now in a place far better than here. For the first time in months, she felt a bit of a relief now that those things had ended. And even though what she felt was just that — only a bit of a relief, the fact that she finally came to feel some thing — anything at all — after a period of numbness did bring some sense of normalcy back into a Dad-less world. It was a foreign world for everywhere that little girl looked, she was reminded of one who was no longer there. It seemed one who no longer lived had taken with him the souls of those who still breathed. With her senses somewhat reawakened, the girl came to feel the tyranny of summer also. It seemed the sneaky heat had built up gradually behind her back and now risen to an acrimonious crescendo in mid-April. She recognized right away what that meant — the New Year celebration wherein people in the old days got together with the members of their clan, made offerings to Buddha at a temple, dispensed good wishes to one another by dousing on the hand some traditional Thai perfume, nam op, and enjoyed a meticulously-prepared and elaborately-decorated feast with their loved ones. The tradition had since morphed into something quite different. By the time the girl was born Songkran had become all about throwing buckets of water and shooting water guns at both friends and strangers and the solemn dignity of the event had become something that existed only in the oral recollection of her grandparents. 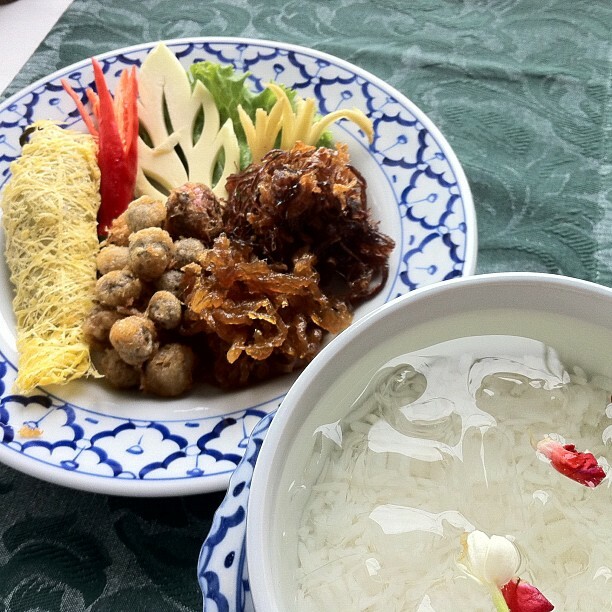 In fact, Songkran had become to her only two things: the time of self-imposed house quarantine or the time to limit one’s driving to the shortest distance possible (which allowed one better chances of both staying dry and staying alive), and the time when her grandparents would host the most elaborate Khao Chae (ข้าวแช่) feast for the entire clan. 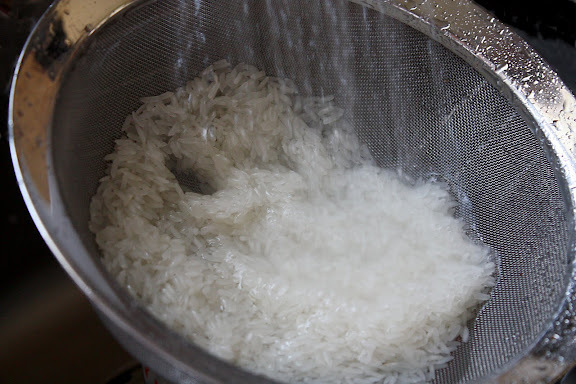 That year, just like every year that came before it, her grandparents would have their workers wake up before the rooster let out the morning crow, pick fresh jasmine flowers from the garden, and boil up one gigantic pot after another of jasmine rice. Green mangoes and cucumbers would be carved into little palm leaves. Fresh fingerroot and assorted peppers were peeled and partly wedged in ways that made them bloom into bite-sized lilies once soaked in iced water. Fruits were transformed into woven baskets. Vegetables were transformed into flowers and leaves. Everything was skillfully shaved, carved, nicked, and chiseled into something else. Manual mutative activities on a grand scale took place each year over there. Those things were irreverently labeled silly; she didn’t really see the point of it back then. Little did she know that they would be what she would yearn to see, touch, and taste again later on in life. In the evening, the whole clan would gather together for the annual Khao Chae dinner, each family bringing one side dish — their specialty. One aunt would always bring Kapi Tod, golden and eggy fried fish dumplings seasoned with herbs and shrimp paste. One uncle would always bring Nuea Wan, spiced and caramelized thin, sticky shreds of beef. There would be many more dishes from the most basic such as Pad Hua Chai Po, thin strands of dried pickled radishes stir-fried with eggs, to something much more involved such as Prik Yuak Sod Sai, stuffed sweet banana peppers encased in crispy, eggy shrouds — the dish which the girl’s grief-stricken mother would be bringing to the New Year feast. For the first night in the past several months since her husband fell ill, the girl’s mother would cast aside her grief and do what she’d always done. Life would go on anyway with or without her consent or participation. It would not wait for any wound to heal or any void to be filled. What was left of the family would bring a dish to the party and do their best to put themselves in a celebratory frame of mind. And they would talk, laugh, play, sing, and eat with the other members of the family — not necessarily in that order. The various sides would be arranged on large platters in the middle of the table. 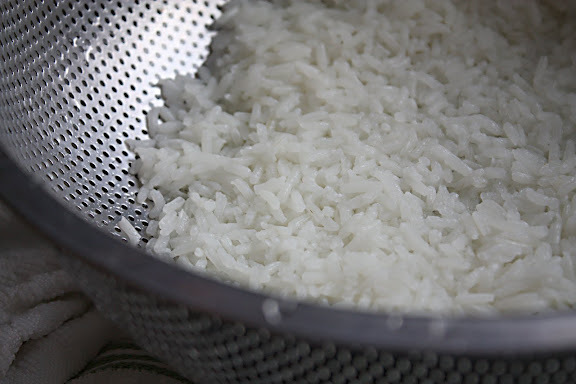 Each person would help himself or herself to a bowl of jasmine rice which had been rinsed several times while still raw to remove any excess starch then cooked in copious amounts of water, pasta-style — the extra steps which, under different circumstances, would not have been so necessary. But, no. Not with Khao Chae. The rice kernels must remain separate and the water crystal clear. 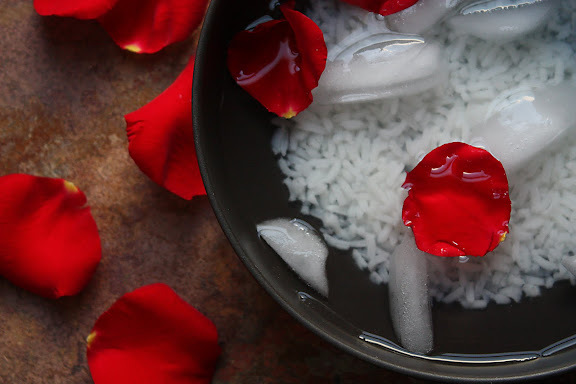 Fresh water scented with jasmine flowers would then be poured over the rice, followed by chunks of ice. 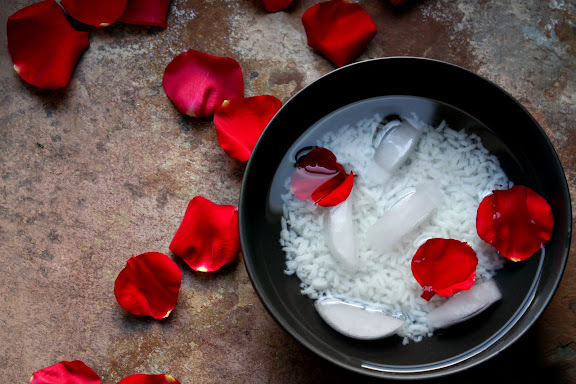 Ice-cold rice “soup” would be joyously slurped alternately with bites of the assorted sides. The series of slurps and bites would be punctuated by the intricately-carved fresh, crunchy vegetables that would cleanse the palate. Nobody would even care how hot and humid it was that time of year. They would be thankful for another year of being together, another feast, another celebration of what they still had despite what — or whom — they might have lost. After a period of such intense grief, even things such as cooking or eating didn’t seem like they would ever become normal again. But watching her mother slice the tops off the fresh peppers and carefully remove the seeds and membranes from each one with her paring knife, getting them ready to be filled, the girl felt strangely comforted. Soon her mother would steam those filled peppers and create a crispy, airy nest for each one of them by drizzling beaten eggs with a fork onto the bottom of a hot pan. Soon they would get dressed, drive to grandpa and grandma’s house, give them the ceremonial New Year greetings by getting on their knees and bowing before the seated couple who would then give them words of blessing. No matter what happened, Songkran would come around every year just as it had always done. And though the dark void in the exact shape of one who had departed was still acutely felt by all, the return of joy no longer seemed so impossible. This post is dedicated to the people of Thailand in this strange time of chaos and celebration. May you find peace and reconciliation. You write with such a sense of haunting grief and optimism that I’m wondering if it’s even possible that it’s not about you. When I first saw this, I thought it would be dessert – I’ve a lot to learn! It certainly looks elegant and pretty enough to be one. Thank you for sharing such a raw and heartfelt post. Happy New Year to you. Traditions and routine are wonderfully comforting. This is a touching post, and your photos are stunning. oh, how beautiful in so many ways. I have never been to your site before, but I will be back. Thank you so much for this beautifully written post. What a beautiful heartfelt post. You’ve articulated the pain of being left behind so well. I am in awe. Beautiful. Being a Chicago-raised girl myself, now transplanted to living in Thailand, I appreciated this post even more. It’s incredible to see the contrast of what is going on over here right now – between the protests and the celebration of this holiday and family. Thank you for sharing a bit of your heart with us. What a sweet post 🙂 The rice does sound really refreshing, I’ll have to keep it in mind once the NYC summer heat really kicks in. Love the post! I think of my grandmother (ยาย yaai) passing away years ago. thanks for such a heartfelt post.